Sheldon Dibble (January 26, 1809 – January 22, 1845) was a missionary to Hawaii who organized one of the first books on Hawaiian history, and inspired students to write more. Dibble was born in Skaneateles, New York on January 26, 1809. He graduated from Hamilton College in 1827, and the Auburn Theological Seminary in October 1830, where he married Maria M. Tomlinson (1808–1837). They arrived in the fourth company from the American Board of Commissioners for Foreign Missions in 1831 on the ship New England from New Bedford. He was one of the youngest missionaries, only 22 years old when he arrived. They had a son who died young and a daughter Mary, who died at 18 months in 1831, and is buried in Lahainaluna alongside her parents. After the death of his first wife, he married a cousin of his first wife, Antoinette Tomlinson (1809–1897), in 1839. They had a son Seymour and a daughter Clara. Antoinette and the children moved back to the United States in 1848. He was first stationed at the Hilo mission, but transferred to Maui island in 1836. He became a teacher at Lahainaluna School, the mission seminary founded by Lorrin Andrews at the time. He thought it strange that students were learning history of other nations, but had no books describing their own history. Starting in 1836 he organized a group of students collecting notes from the chiefs and elders of the community, guided by a questionnaire. One of the older students, David Malo, had served as court genealogist during the time of Kamehameha I so took the lead. In November 1837 (after the death of his first wife) he left and returned to the Auburn Seminary in New York in spring of 1838. In the winter of 1838-1839 he toured the southern United States and gave lectures on Hawaiian history, publishing a 250-page volume of notes. By the fall of 1839 he sailed back to Hawaii, arriving again in the spring of 1840. At the general meeting of missionaries in May 1841 he was assigned the task of continuing to refine the book. Lorrin Andrews had a printing press delivered to the Lahainaluna school in 1833, and a number of students had been using it to print newspapers and short text books. The first edition was published on April 28, 1843. He helped establish a Royal Historical Society with Malo and Samuel Kamakau and others, and acted as the first secretary. ^ a b William Drake Westervelt (1908). Annual report of the Hawaiian Historical Society. Hawaii Historical Society. p. 17. hdl:10524/58. ^ a b Samuel Orcutt (1891). Henry Tomlinson, and his descendants in America: with a few additional branches of Tomlinsons, later from England. Press of Price, Lee and Adkins Co. p. 96. ^ a b Sheldon Dibble (1843). History of the Sandwich Islands. Lahainaluna: Press of the Mission Seminary. ^ David Malo, translated by Nathaniel Bright Emerson (1903). Hawaiian antiquities (Moolelo Hawaii). Hawaiian gazette co., ltd.
^ Sheldon Dibble (1839). History and general views of the Sandwich Islands' mission. New York: Taylor & Dodd. ^ Larry I. Miller (March 31, 1975). "Hale Pa'i nomination form". National Register of Historic Places. National Park Service. Retrieved 2009-07-18. ^ Hawaiian Mission Children's Society (1901). Portraits of American Protestant missionaries to Hawaii. Honolulu: Hawaiian gazette co. p. 30. ^ Sheldon Dibble (1909). History of the Sandwich Islands. Honolulu: Thomas George Thrum. ^ Sheldon Dibble and students of Lahainaluna (1838). Ka Mooolelo Hawaii: The History of Hawaii. University of Hawaiʻi Press, third in the Hawaiian Language Reprint Series, Ke Kupu Hou, 2005. ISBN 0-945048-15-7. Archived from the original on 2009-07-15. The ʻAi Noa, was a period of taboo-breaking which convulsed the Hawaiian Islands in October 1819. Women were allowed to eat forbidden food and to eat with men; the priests were no longer to offer human sacrifices; the many prohibitions surrounding the high chiefs were relaxed. 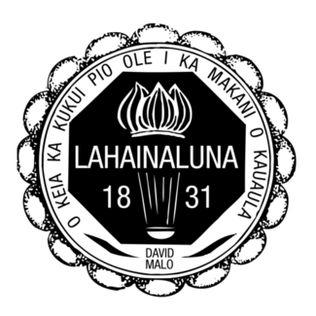 Lahainaluna High School is a grade 9–12 public school located in Lahaina, Hawaii. It was founded in 1831 as a Protestant missionary school, originally named Lahainaluna Seminary. The early missionaries who arrived in Lahaina in 1823 explained to the Hawaiian Royalty the importance of an educational institution in the American style. Moses Kekūāiwa was a member of the royal family of the Kingdom of Hawaii. 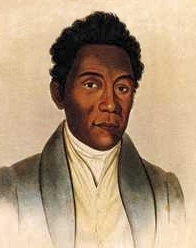 George Cox Kahekili Keʻeaumoku II or Keʻeaumoku ʻOpio (1784–1824) was part of an influential family at the time of the founding of the Kingdom of Hawaii. he served as a military leader, and then became a convert to Christianity and Royal Governor of Maui. He is sometimes called Keʻeaumoku III if Keʻeaumoku Nui is counted as Keʻeaumoku I and Keʻeaumoku Pāpaʻiahiahi is counted Keʻeaumoku II instead. David Malo or Davida Malo (1793–1853) was a leading Native Hawaiian historian of the Kingdom of Hawaii. He became a Christian minister and founded a church. Asa Thurston and Lucy Goodale Thurston were in the first company of American Christian missionaries to the Hawaiian Islands. Dwight Baldwin was an American Christian missionary and medical doctor on Maui, one of the Hawaiian Islands, during the Kingdom of Hawaii. He was patriarch of a family that founded some of the largest businesses in the islands. Lorrin Andrews was an early American missionary to Hawaii and judge. He opened the first post-secondary school for Hawaiians called Lahainaluna Seminary, prepared a Hawaiian dictionary and several works on the literature and antiquities of the Hawaiians. His students published the first newspaper, and were involved in the first case of counterfeiting currency in Hawaii. He later served as a judge and became a member of Hawaii's first Supreme Court. William Richards was a missionary and politician in the Kingdom of Hawaii. William Patterson Alexander was an American missionary to the Kingdom of Hawaii. His family continued to influence the history of Hawaii. Kaukuna Kahekili, often called Kehikili or Kehikiri in earlier sources, was a Hawaiian high chief during the early period of the Kingdom of Hawaii. Boaz Mahune was a 19th-century politician and civil servant of the Kingdom of Hawaii. He helped contribute to the writing of the 1840 Constitution of the Kingdom of Hawaii and was the author of its preamble the He Olelo Hoakaka, or the Declaration of Rights of 1839. S. N. Haleʻole was a leading Native Hawaiian writer and historian of the Kingdom of Hawaii. He is noted for authoring The Hawaiian Romance of Laieikawai, the first fictional work of literature produced by a Native Hawaiian. Ephraim Weston Clark is most remembered for his decades of work helping to translate the Bible into the Hawaiian language, and his subsequent work on the 1868 revision of the translation. He was the third Kahu (pastor) of Kawaiahaʻo Church in Honolulu, and served in that position 15 years. His early years as a missionary were spent on the Hawaiian island of Maui; while serving as Kahu of Kawaiahaʻo, he also spent several months with the Hawaiian Missionary Society in Micronesia.